I'm moved. It was hard. There was an EXTREMELY heavy family heirloom dresser involved. Bez earned every last drop of the case of beer coming her way. And my new roommate went from the typical bachelor empty refrigerator to living with someone who has fifteen different types of baking chocolate on hand at all times. Of course, I'm eating out this first week. Lucky for me, and unfortunate for the drinking establishments in North Brooklyn, I managed to move myself a neighborhood away from my newest friend, Ginger. In celebration of my first night in Brooklyn, her and I went out drinking-I know, you're not surprised. And true to our broke-ness, our first stop was Alligator Lounge II. 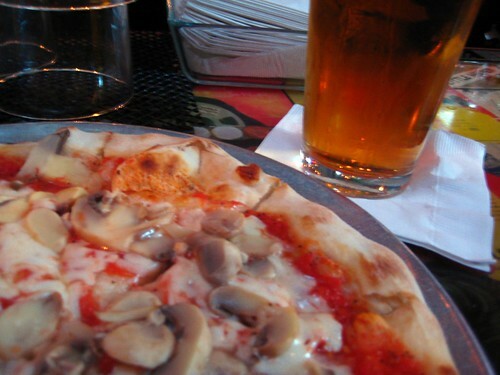 Yes, my first Brooklyn meal consisted of a $1 pizza with mushrooms with a pint of blueberry beer. Not elegant, not sophisticated, and completely up my alley. It's free with beer pizza. Not the greatest, but awesome when you're broke, hungry, and out drinking. Crocodile Lounge near Union Sq. offers the same pizza deal! 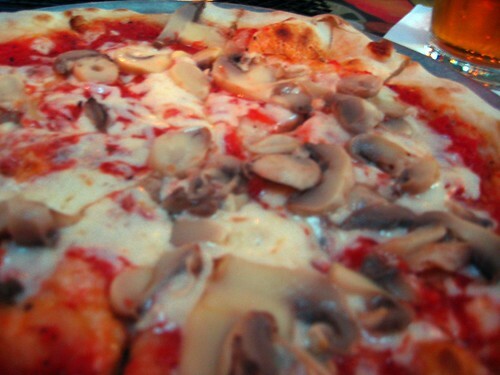 Too bad Artichoke Pizza (best in town IMO) is right across the street to steal the show!